Here in North America, where much of the continent is battling ice, snow and bone-chilling cold, this may seem like a very bad time of year for a bird to nest. But to the great horned owl, February is the ideal month to breed, nest, incubate eggs and rear young. The most widely distributed owl of the Americas, the great horned owl is found throughout the continental United States as well as in Alaska. Its range extends southward into Mexico and Central and South America. “With its long, earlike tufts, intimidating yellow-eyed stare and deep hooting voice, the great horned owl is the quintessential owl of storybooks,” states the Cornell Lab of Ornithology. A great horned owl carries a black racer to her offspring perched in a tree in Fort SeSoto County Park, Florida. Photo donated by National Wildlife Photo Contest entrant Kathleen Finnerty. It also may be our most adaptable owl species. Common and widespread, great horned owls are at home in deciduous and evergreen woodlands, swamps, deserts, tundra edges and tropical rain forests. The birds also thrive in farmlands, orchards, suburbs and even cities. Nocturnal predators, great horned owls feed on practically any living thing—from fish, frogs and scorpions to squirrels, skunks and ducks to bats, house cats and small dogs. 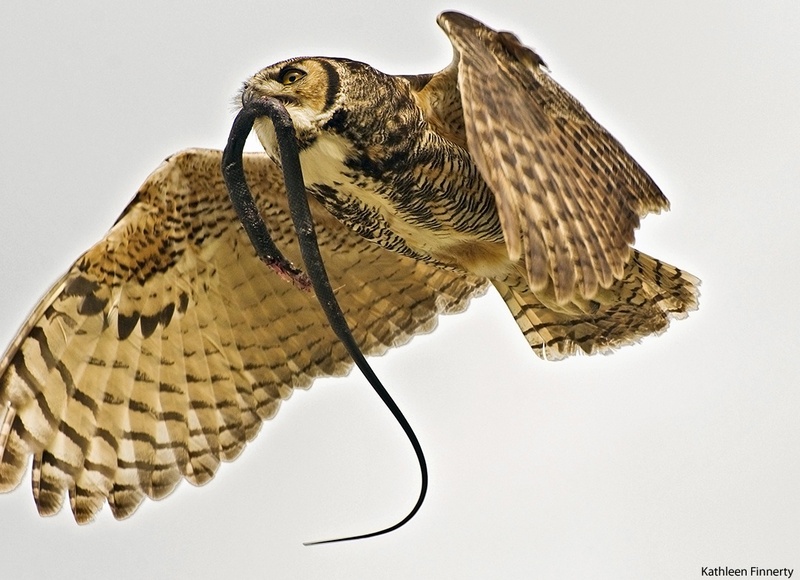 They will even take down large raptors including hawks, ospreys and other owls. According to Cornell, the birds “have the most diverse diet of all North American raptors.” Major predators of American crows, great horned owls may be mobbed for hours by large flocks of the agitated corvids. 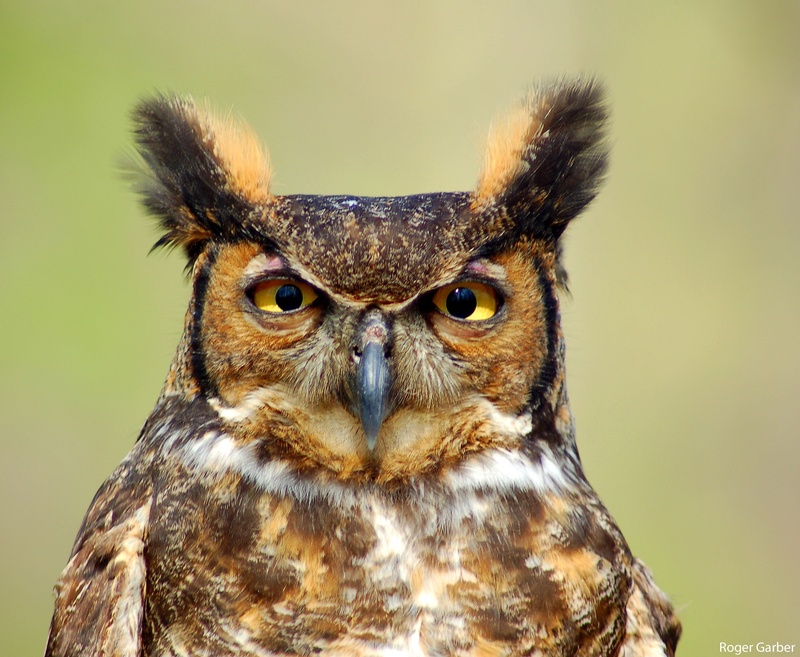 Great horned owls are also one of the continent’s earliest birds to nest, breeding and nesting in January or February. Like other owls, they do not build their own nests and prefer to take over the abandoned homes of other species, including squirrels, ravens, herons and, especially, red-tailed hawks. The Cornell Lab of Ornithology calls the great horned owl “the quintessential owl of storybooks.” Photo donated by National Wildlife Photo Contest entrant Roger Garber. According to NWF Naturalist David Mizejewski, red-tailed hawks and great horned owls often inhabit and feed in the same territories. “But because the owls are nocturnal and the hawks are diurnal, the two species tend to eat different prey, so do not compete with one another,” he adds. Silent, stealthy predators active primarily after dark, great horned owls can be difficult to spot. But listen for their distinctive loud hooting, particularly this time of year when the birds are nesting. You can help great horned owls that live near people in farmlands, suburbs and cities by cultivating a diversity of the native plants that nurture the raptors’ prey. Gardening for Wildlife is a great way to provide food, water, shelter and places to raise young not only for owls and other birds but for all types of native animals. To watch a great horned owl tending its chicks in a Florida nest last winter, check out this video shot by National Wildlife Photo Contest winner Derek Drudge.